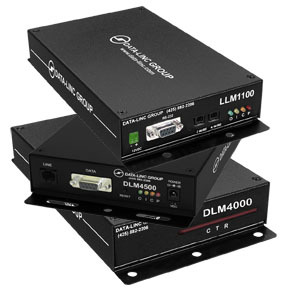 Data-Linc Group’s DLM4000 series of voice band modems offers maximum versatility and reliability in remote process control and data acquisition. From dial-up, leased and private line applications, the DLM4000 series provides unsurpassed flexibility in any industrial application. The DLM4000 series uses advanced Trellis coding, error correction and data compression technology for virtually error-free data communications. An uncompressed PLC line speed of up to 19.2 Kbaud is standard; however, port baud rates of 1200 through 115.2Kbaud are also available. The DLM4000 operates full/half-duplex on two wires. The asynchronous digital interface can be either RS232/422 or AE485 (AE422/485 Auto Enable function compatible with RS422/485). The DLM4000auto-answer AE485 version easily provides long distance polling of multiple PLCs at a remote site. The polling operation performed by the Master is completely transparent to the DLM4000. No additional Master programming is required— simply enter the Remote DLM4000 telephone number. Housed in a rugged steel enclosure for optimal EMI resistance, the DLM4000 series is factory configured for trouble-free installation. No programming or configuration is required. An Auto Alarm Dial Back module is available on the DLM4000. This gives the Remote PLC the ability to establish a data path to a Master PLC or PC via a logic input from the Remote PLC to the Auto Alarm Dial Back module. This could be used for Remote alarming or time-based data updates. Standard. NEMA 1; 18-gauge steel with mounting flanges.